Have you ever wanted to build a custom enclosure, oddly shaped structure, waterproof canopy, camper shell, or special box — only to be frustrated by the cost and effort involved in fabrication? You know the scenario: without facilities for this kind of work, you end up spending far too much, compromising your design with scrounged junk, or simply forgetting the whole damn thing. 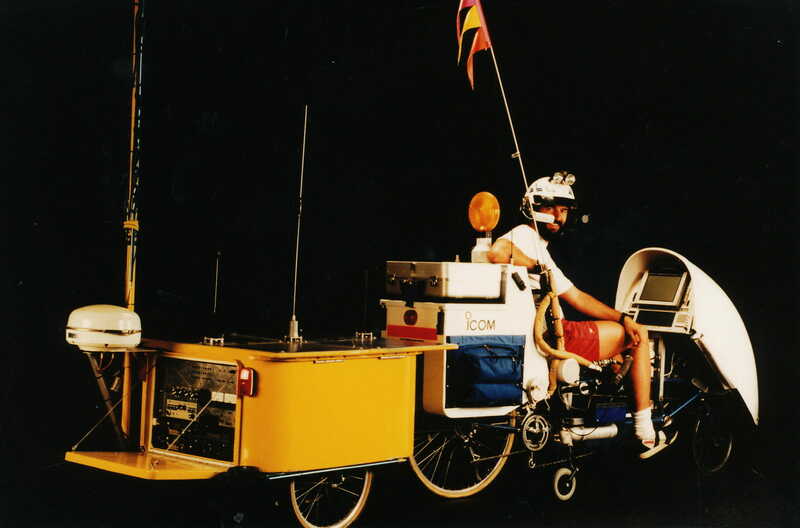 This is the mode I was in back in 1990 when designing BEHEMOTH’s trailer (or WASU, for Wheeled Auxiliary Storage Unit). 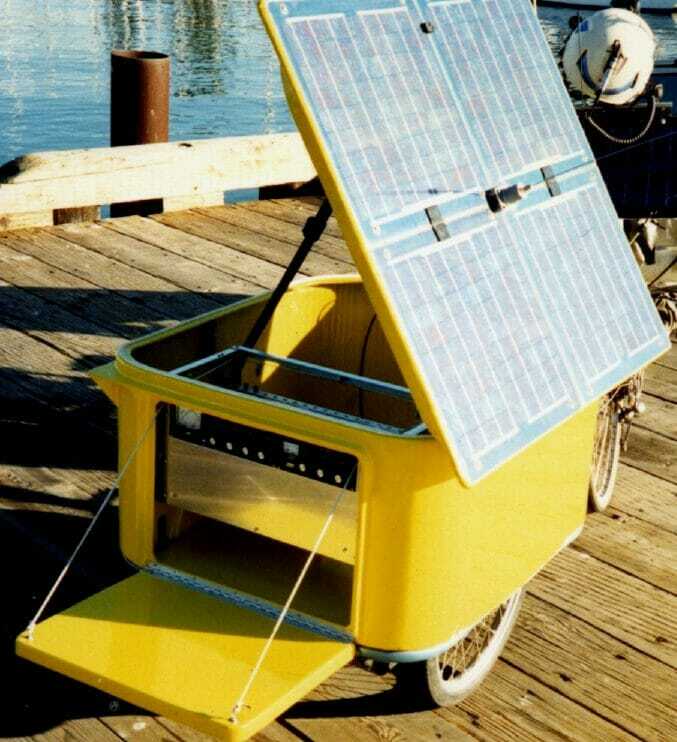 I knew what I wanted — a lightweight, waterproof, aerodynamic structure with wheel wells, special flanges for equipment and antenna mounting, sealed access panels, a 72-watt solar lid, and so on. But how would I build such a thing? I even considered hacking up one of those hideous black plastic tool bins they sell for pickup-truck beds. I described the whole problem to David Berkstresser one evening. 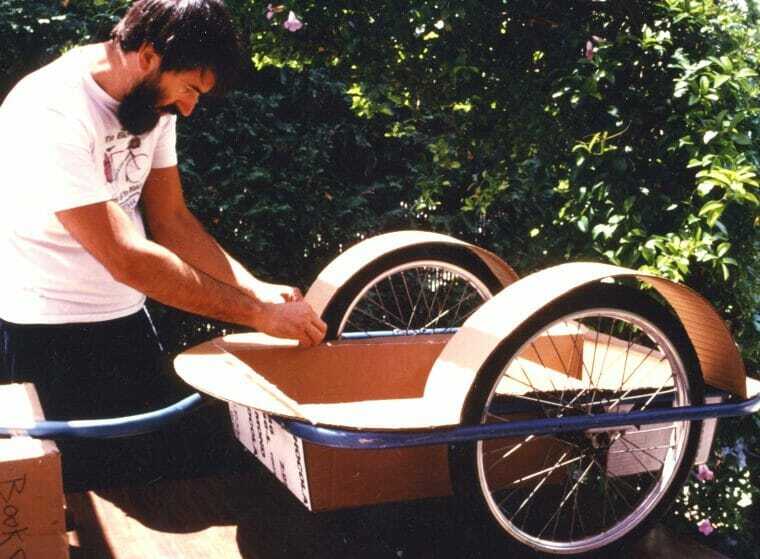 David is one of those wizards who can sketch a dozen unique solutions to any mechanical problem that seemed impossible only moments before, and is the designer of the eccentric, agile, and swift Vacuum Velocipede human-powered vehicle. He also did the CAD work on my folding console, machined the Private Eye mounting, designed the new steering system, and added various other artistic engineering touches to BEHEMOTH. 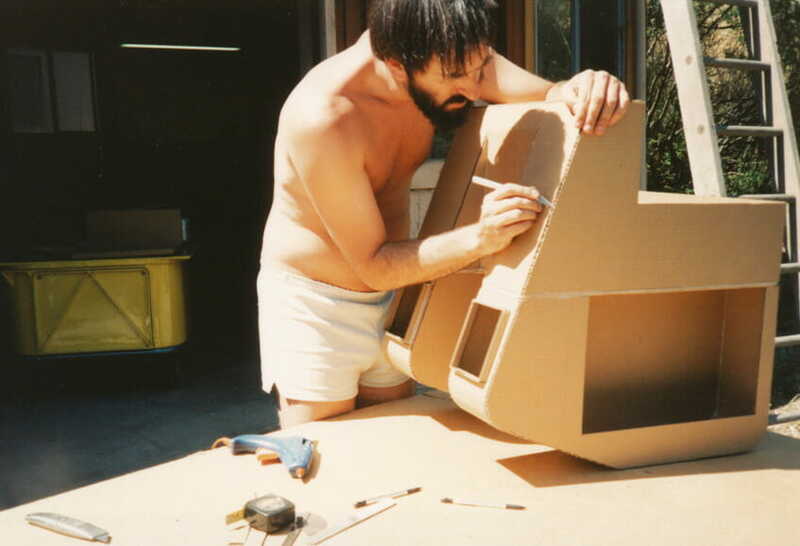 “Build it with cardboard,” Dave told me, taking a sip of beer. The elegance of his suggestion was instantly obvious. All sorts of structures ranging from airplane wings to transit boxes for delicate equipment are made of composites, structures that consist of two walls separated by a “core.” Usually some kind of foam or honeycomb, this is what keeps the thin walls at a constant distance and provides the dimensionality and moment that keeps them from collapsing. Some of these materials, such as Hexcel, are among the most high-tech structural materials available. And garden-variety corrugated cardboard is a close analogue! It is used everywhere you look for very good reasons: it’s strong, light, and cheap. Covered with fiberglass, it’s waterproof, good-looking, and stronger still. And best of all, it is infinitely hackable… if you screw the design up, you can always scrounge more cardboard and brush on some more goo. Needing a name for this wonderful discovery, Dave and I puzzled for a while and finally came up with CSPC… or Cellulose-core, Silicon-matrix, Polyester-filled Composite. 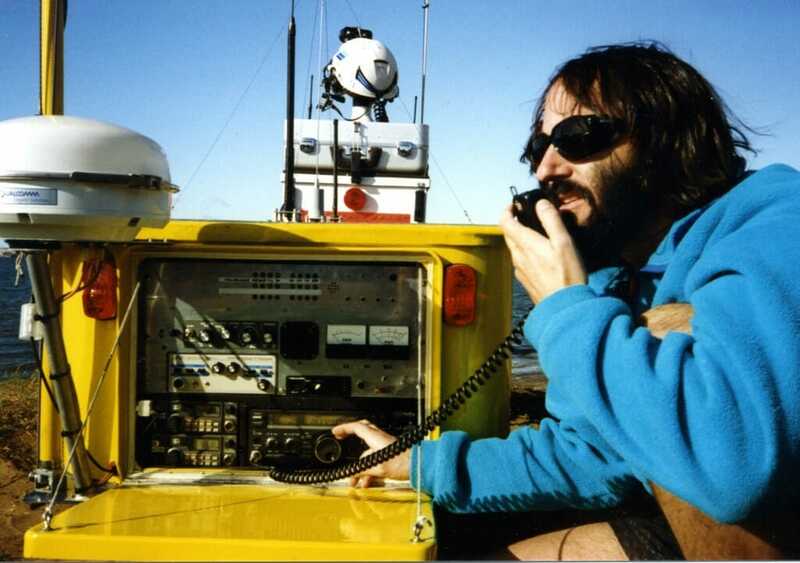 The results were beautiful: I built BEHEMOTH communication and power systems into a blazing-yellow custom trailer that looks like a cross between a ’56 Buick and a solar-panel-encrusted satellite… and then later, used the same technique to build the equipment enclosure behind the seat. The first step in building anything using this method is to noodle over it for awhile, sketching and perhaps even making models until you know what you really want. Then buy a hot-glue gun and lay in a good supply of cardboard. A note here about materials. Corrugated cardboard comes in all sorts of styles (never thought about this before, did you? ), ranging from heavy thick mushy stuff to thin, brittle material that cracks when you bend it. Somewhere in between is the right stuff — look for a good stiff feel, thin walls, and consistent corrugations. There’s no reason to go with heavy cardboard for strength: all we’re trying to do here is hold the two fiberglass layers in a fixed relationship. Get material that feels clean and light, and hasn’t been walked on or creased. Now you can start construction. Using a metal yardstick and a good sharp knife (X-acto or retractible), cut the pieces as you need them, being conscious of “grain” wherever you have to make a bend. At every junction, run a bead of hot-melt glue, on both sides if necessary. Don’t let the glue glob up — it’s a pain to work lumps down to a smooth curve that won’t bubble the fiberglass. Gentle simple curves, like the front of my trailer, can be distributed uniformly over a large surface by pre-bending the cardboard over a table edge, parallel with the corrugations, one step at a time. By carefully creasing the material at every wave, it will hold a smooth curve — though the inside surface will be rippled and cause lots of tiny air gaps. It turns out that this doesn’t matter much. Dave swears that he has made compound curves by carefully analyzing the corrugation pattern and making tiny, well-placed incisions with a sharp knife. I find this astonishing, but knowing Dave, it’s probably true. Experiment. Edges can be messy. They became an issue in two parts of the trailer: the outside exposed rim of the solar lid, and the edges of the long stabilizing strips that add strength to walls. Details in a moment, but be aware that every exposed edge will take extra effort and try to keep them to a minimum. Don’t create any situations where you won’t have easy access later during the glassing process. Over time, you’ll intuitively recognize the behavior of the stuff, but for now just make everything as open as possible. Really tight spots may be better approached using two or more parts that are later joined — it will keep resin off your elbows, and probably look better. 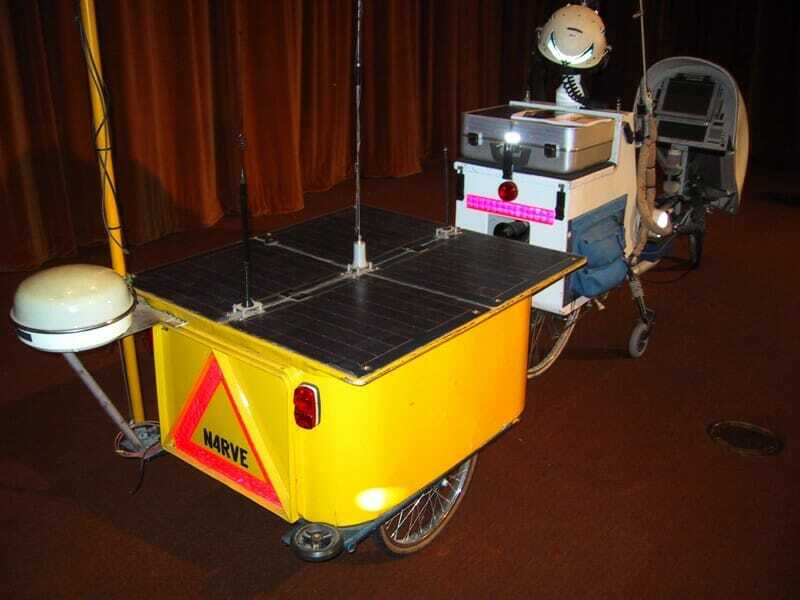 With the trailer complete, I used the same method to build the electronics enclosure behind the bicycle seat. Here, I was radiusing the edges to allow the cloth to lay smoothly with the help of filler. This ended up carrying subpanels, batteries, computers, lighting, stereo speakers, 7-liter water tank, connectors, and packs. Once you have the structure intact, stare at it, play with it, and think through the ramifications of the design. It will be hackable later if you forget something, but it’s more so now. If there’s anyplace you will have a bolt compressing the surface, mash the cardboard flat or cut it back and fill with cloth so it won’t collapse and loosen later; wherever there will be major stress, add reinforcement. Smooth the glue blobs, round the edges (I did the outside edge of the solar lid by gluing on half-round pine and shaping the corners with a file), and mentally run through the glassing process. Like it? Time to make it permanent. When you go out looking for fiberglass material, you’ll find yourself deluged with options (unless you go to the local hardware store, in which case you’ll have too few). I was in Silicon Valley at the time, and used Tap Plastics, a supplier with lots of stores whose personnel were quite knowledgeable about the fiberglass cloth and resins they sell. You can also buy retail from West Marine, or mail order from the two biggies in the kit airplane business: Wicks Aircraft Supply and Aircraft Spruce & Specialty. First, polyester resin versus epoxy. Polyester is cheaper and much less nasty to work with (though it stinks more), but is less strong. 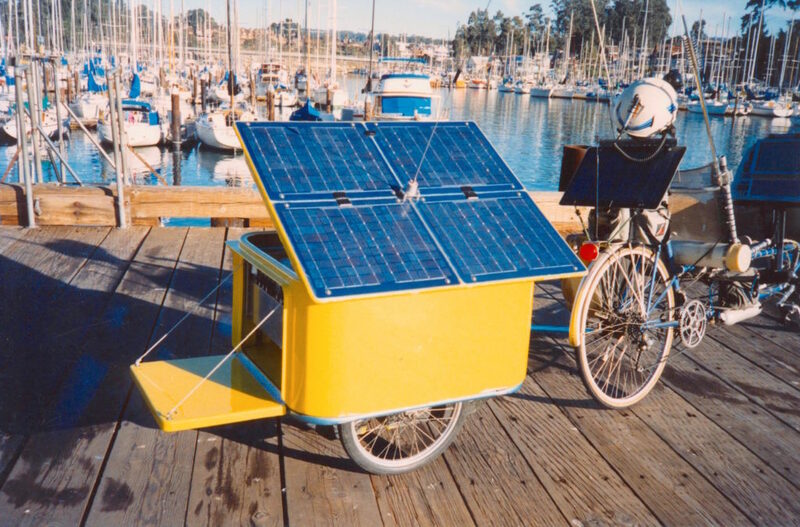 Your application will determine which makes more sense — although I used epoxies years later on the Microship, for the less-critical bicycle projects I used polyester… so that is what we assume in this article. Also, be aware of the meaning of “surface curing agent” — a waxy additive that seals the layup to help it cure. Problem is, it also interferes with adding additional layers. Avoid this entirely, and use structural layup resin or bond coat, not surfacing resin. My personal preference is the thixotropic structural layup resin — it’s easy to brush on, doesn’t sag or puddle, and cures quickly. You’ll also need catalyst, which is the highly poisonous Methyl Ethyl Ketone Peroxide (MEKP) that should never, ever, get in your eyes. And if weight is critical, you can add millions of tiny air pockets by mixing “micro balloons” with the resin. Other materials for the job are mixing cups (start with the graduated paper measuring cups, then once you get the hang of it you can switch to old tin cans), stirring sticks, cheap brushes, acetone for cleanup, paper towels, and scissors. You also need to decide how you want to keep the stuff off your hands, and TAKE THIS ISSUE SERIOUSLY! These chemicals have a cumulative effect when absorbed through the skin, and you may get away with sloppiness for years then suddenly develop an agonizing, lifelong allergic reaction to resin and catalyst. The homebuilt aircraft world is full of sad stories about people who sold their partially-built planes after careless habits made dealing with fiberglass impossible. When I started this project, I used rubber gloves and kept a bar of Neutrogena handy. The gloves were loose and sloppy, and led to more of a mess than doing it barehanded — but it took a while to develop techniques of dealing with the brush and mixing can (like always wiping at the seam so you know where not to touch). After a few sessions, I abandoned the sticky gloves and tried to be careful, washing after every batch and using “Glove Cote,” which is a lanolin-based cream that’s supposed to keep you safe. I’m careful anyway. OK, ready to start? Take the phone off the hook. A batch under normal thermal conditions will only last about 10-15 minutes, so you don’t want interruptions. 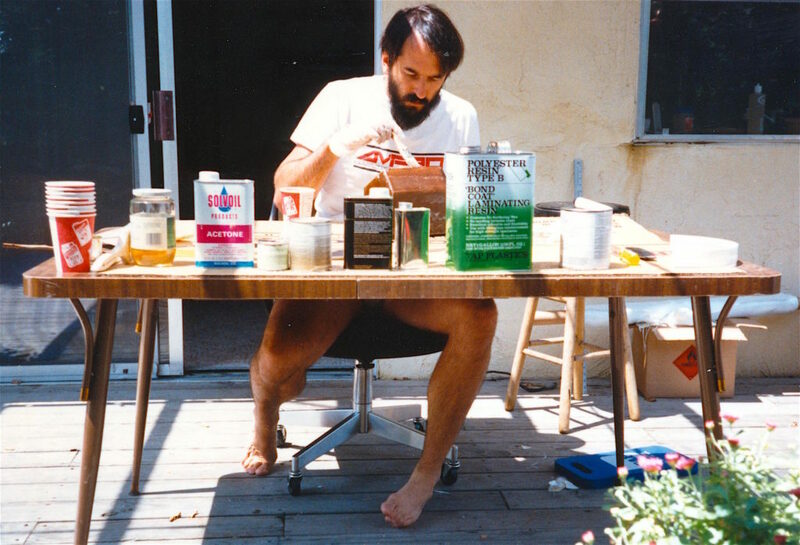 Mix the stuff according to directions (around 5 drops of catalyst per ounce of resin, more if it’s cold or you want a fast cure) and lay down a preliminary coat on the cardboard surfaces you’ll be working on first — this helps adhesion and is quite necessary. When the batch starts to thicken, STOP — it won’t soak in, and will have the opposite effect instead. Now cut your first pieces of cloth and lay them on the cardboard, which should be tacky. The wrinkles will brush out. Start laying up the structure, adding layers where you think the major stresses will concentrate (corners, support points, etc). This is where the art comes in — after a while you’ll just know how much cloth to use and how thickly to brush on the resin. In general, you want to use just enough to make the cloth transparent, but not enough to puddle. The strength lies in bonded cloth, not globs of brittle resin. Take successive passes at the work, never mixing more than 5 ounces of resin or so unless you’re covering a large area with a large brush. Overlap the cloth by a few inches, and keep working at it until you feel that the coverage is complete. Notice the material’s reluctance to take sharp bends… this is how you gradually home in on the constraints that affect the initial cardboard design. On exposed edges, let the wetted cloth hang off — don’t try to wrap it around. Finishing the edges is easy if you do this. After it’s all dry, you can slice the excess cloth with a sharp knife, then use a file to remove any sharp points. It will look terrible. But now mix up a small batch of Tap 500 plastic filler and work it into the exposed corrugations with a plastic squeegee, then file and sand after it dries. The result will be a smooth, waterproof edge that takes paint easily and completely conceals the truth — that the core of this beautiful structure is an old cardboard box! How pretty do you want this? If you’ve come this far, you’ll have a rather ugly brown material, with lots of ragged overlaps and texture variations. If the need is purely structural, this may be the place to stop. There are two ways to add color. First, as I did on the trailer’s underside, you can mix special concentrated pigments with the resin (I used black). This in no way alters the surface texture, but it does hide the big Hotpoint logo which would otherwise show through the fiberglass. The other way is with paint, and this is another one of those areas where time, money, skill, experience, and luck all conspire to yield either beauty or a giant mess. I did the trailer lid with yellow Copon epoxy paint and had all sorts of problems — now I need to sandblast it off and try again. The body is another story: Maggie put her old auto-body skills to work during a full week of applying Tap 500 (like Bondo, but much more flexible) and sandpaper, finally perfecting the surface with glazing putty. We then took it to Charles Tripp in Los Gatos, who did a beautiful job of spraying on DuPont Imron (a feisty thoroughbred of paints, not for the poor or fainthearted). The stuff is over $100 a gallon and can cause respiratory failure if you spray without breathing apparatus, but it looks great. It’s pretty, but is still a bit fragile when abused… and inside, where there is no bodywork, adhesive-based cable tie downs can easily detach a circle of paint. And there you have it. The trailer, for a moderate amount of time and money, looks professional enough to prompt people to ask where I bought it. I grin and tell them it’s just some old cardboard boxes, glass, goo, and Imron paint, all mounted on a custom chrome-moly frame built by Rock Lobster and painted by Dr. Deltron. They don’t believe me. I do have one final suggestion if you try this on your own structural fabrication problems. Do an unimportant test project first to get most of the mistakes out of the way. That first layup will seem awkward and messy, with the cloth buckling and resin dripping down your chin. But give it a chance… it works! An article from the same time frame gives a few more details (with photos) of this technique applied to the RUMP enclosure behind the seat.